Springfield's new XDm 3.8 has a slightly shorter barrel but a whole lot of capacity. The pistol we know as the Springfield XD first hit U.S. shores in 2000 as the HS-2000. It didn't sell so well, but there was nothing wrong with the gun. All it took for the polymer-framed blaster to take off was for Springfield Armory to put its marketing muscle behind the excellent Croatian pistol and get the word out about the gun it christened the XD. Once gun magazines started heralding the XD's great safety features, reliability, 1911-esque grip angle and reasonable price, American shooters flocked to the striker-fired import like kids to candy. The XD was originally offered in a four-inch Service model in 9mm or .40 S&W. Not surprisingly, five- and three-inch versions soon followed, as did .357 SIG and .45 ACP variants. All those model and caliber variants have made the XD series one of the most popular pistols on the market. Springfield probably could have stood pat with the original XD and continued to sell them as fast as they hit the warehouse, but the folks at Springfield saw room for improvement. Springfield's new XDm line of pistols is the result of those efforts, and the XDm 3.8 is the latest offering. The XDm 3.8 mates a slightly abbreviated 3.8-inch barrel with a full-size grip. The result is an eminently concealable defensive pistol with a confidence-inspiring magazine capacity of 19 rounds. The 3.8's frame has all the improvements of the XDm line, starting with what Springfield calls its Model Contour Frame. Though the polymer frame retains the original XD's 1911 grip angle, the frame has been contoured to make it even more comfortable in the hand and easier to hold on to in long, rapid-fire strings. Further aiding in the control department is the new Mega-Lock Texture on the frontstrap, backstrap and the front half of both sides of the grip. According to Springfield, the new cuts are the perfect angle and depth to give your hand the best traction. The assertions proved true in my testing. XDm-series frame improvements also include what Springfield calls its Maximum Reach magazine release. The name is a bit misleading because, although the ambidextrous release is slightly extended, the easier reach is a result of the recontoured frame, not an oversize magazine release. The new contours allow all but the smallest-handed shooters to hit the magazine release without shifting their grip. Speaking of magazines, the XDm series uses Springfield's polished, stainless steel Mega-Capacity magazines, which hold 16 rounds of .40 S&W or, in the case of the test gun, 19 rounds of 9mm. Perhaps the most significant feature of the XDm's frame is its interchangeable backstrap. Although it's not a new idea, the XD is a better pistol for it. I am a short guy with correspondingly small hands, yet thanks to the small backstrap, the XDm test gun fits me about as well as my favorite 1911. Other frame features include a grip safety and a Picatinny-spec accessory rail that Springfield calls its Multi-Adjust Rail System. The rail has three slots to allow some flexibility in positioning a light or laser. Lights from Insight Technology and SureFire slid on and off the rail easily and locked up positively. The XDm's Minimal Reset Trigger is probably the best I've felt on a polymer gun. Its reset is, indeed, the shortest of any polymer pistol on the market. Trigger reach and travel are also quite short. Springfield's Ultra Safety Assurance, or USA, trigger system locks the trigger in place until direct, rearward pressure is placed on a lever set in the face of the trigger. The single-action pull is fairly clean and breaks at a modest six pounds, four ounces on my test gun. Factory specs call for a pull weight of 5.5 to 7.7 pounds, so my test pistol is well within spec. The XDm's grip angle is similar to the 1911's and also includes a grip safety. The new contour makes it much easier to activate the mag release. Other frame-mounted controls include a robust slide release and Springfield's Minimal Error Disassembly lever. Disassembly is straightforward and safer, thanks to the fact that the new lever disables the firing system when you rotate it upward. I really like the fact that the disassembly process doesn't require you to pull the trigger like many competing designs do. To disassemble the 3.8, simply drop the magazine, lock the slide back, rotate the lever upward, and ease the slide off the frame by lowering the slide lock while restraining the slide with your other hand. It takes literally just a few seconds to completely field-strip the pistol. Reassembly is just as fast and easy. The slides on the new XDm line boast wider, more aggressive slide serrations. The serrations on the 3.8's beefy steel slide are also curved. The nonslip design works as advertised; it provides a rock-solid grip even with sweaty hands. Low-profile, no-snag sights are dovetailed into the front and rear of the slide. Both have bright, white-dot inserts for better low-light sight acquisition. The firing pin protrudes from the rear of the slide to serve as a cocking indicator. A loaded-chamber indicator on top of and at the rear of the ejection port provides visual and tactile confirmation of the chamber's status. The 3.8's barrel is a 3.8-inch, match-grade, ramped tube. It and the slide are finished in a rugged, corrosion-resistant, black Melonite finish. The full-length guide rod incorporates a captive recoil spring system. The standard XDs I've tested have all shot great, but the addition of a match-grade barrel certainly didn't hurt, as evidenced by my test gun's outstanding accuracy. The XDm 3.8 comes with everything you need to get started. A pair of 19-round magazines, a polymer holster, a double magazine pouch and a loading tool are all standard. The whole kit and caboodle comes packed in Springfield's rugged multi-use carrying case. I am equally fond of the new XDm's ergonomics. Its sights are fast and easy to acquire, and the trigger, at least in my dry-fire practice, was exceptional for a polymer piece. I really like its handling qualities and the way it comes up right on target for me. Fit and finish of the slide, frame and barrel are exceptional, which can be attributed to the fact that all three parts are numbered at the factory and assembled together, rather than being cobbled together with whichever part comes to hand from a parts bin at the end of the assembly line. The XDm 3.8 showed up just before I left for a deer hunt, so I took it with me. I didn't begin testing with my normal seven-yard, slow-fire routine. Instead, I spent the first few days wearing the new XDm in the supplied holster and plinking with it whenever the urge struck. I used it to smoke a couple of jack rabbits and corn-thieving raccoons, and I used it ventilate the odd dirt clod and cow patty from five yards all the way out to 53 long paces. The XDm incorporates the same trigger safety as the XD, and a new takedown lever allows disassembly without having to pull the trigger. The XDM 3.8 comes ready to roll with two magazines, a holster, a double magazine pouch and a magazine loader. The new pistol fed, fired and ejected flawlessly and hit where I pointed it. By the time I cleaned the 3.8 and walked over to the ranch range for some serious testing, I already had a darn good feel for the little high-cap 9mm's trigger. Because its barrel is less than four inches, I did all my formal accuracy testing from the 15-yard line with a couple of sandbags and a solid bench. I started out with a dead-on hold on a three-inch Shoot-N-C sticker. The resulting group was impressive and easily inside the sticker, so I settled in to try to shoot some tiny groups. The little 3.8 performed very well from the bench. Recoil was pretty much nonexistent, and my three test loads all hit reasonably close to the top of the front sight at 15 yards. None were dead-on, but all were within an inch or so of dead center--an easy fix thanks to the drift-adjustable sights. A few weeks later, I headed out to the local sheriff's department range to train with a couple of buddies. I brought along the XDm 3.8 and another 450 rounds of ammunition so I could get their opinions. I was most interested in testing the pistol's reliability and getting their impression of the gun's sights, trigger and ergonomics, so we did most of our shooting from the seven-yard line. Each shooter started out slow to get a feel for the gun, but I had them speed it up quickly. The first shooter was a police firearms instructor with a lot of time behind various XDs. He is 5'8" with average-size hands. He fired about 150 rounds through the little 9mm, most of them at warp speed. He liked the feel of the small backstrap and opined that the XDm's trigger was as nice as he's ever felt on a polymer gun. He also really dug the gun's 19-round magazine. The second shooter is also a police officer as well as a competitive shooter. He's 6'3" with large hands. Even so, he chose the medium-size backstrap when it was his turn to put the XDm through its paces. He fired about 200 rounds, with the majority spewing forth from the polymer gun at a blistering pace. He had no trouble smacking down targets of various sizes from seven yards out to 25 yards and making it look easy. He couldn't stop raving about the feel of the grip, and of the 19-round capacity all he could say was, "Damn, that's fun," as the brass piled up beside him. Overall, I was impressed with the new Springfield XDm 3.8. It is a well-made pistol that runs as reliably as any pistol extant, and it shoots good, too. The gun's 1911 grip angle and interchangeable backstraps mean it will fit just about anyone's hand and make it comfortable to shoot. 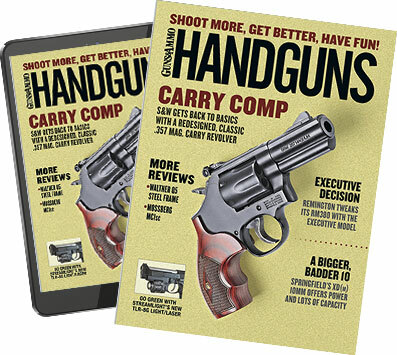 Combine those features in a package that comes with everything you need to hit the street--at a price most shooters can afford--and you've got a superb pistol for concealed carry or duty use. Three interchangeable backstraps make the new XDm fit a wide variety of shooters' hands. Notes: Accuracy results are the averages of five five-shot groups fired from a sandbag rest at 15 yards. Velocities are the averages of five shots measured over a Shooting Chrony placed 10 feet from the muzzle. Abbreviations: JHP, jacketed hollowpoint.